Has Sciatica Sidelined You During Pregnancy? The sciatic nerve is the longest nerve in the human body and travels from your low back, pelvis, buttock, thigh, and calf all the way down to the foot and toes. Sciatica is often an intense shooting pain, numbness, or tingling that can stay in your low back and buttocks or run all the way down the course of the nerve down the leg. There are a number of causes of sciatica. It is not uncommon to experience sciatica pain during pregnancy, and it’s most common in the third trimester. 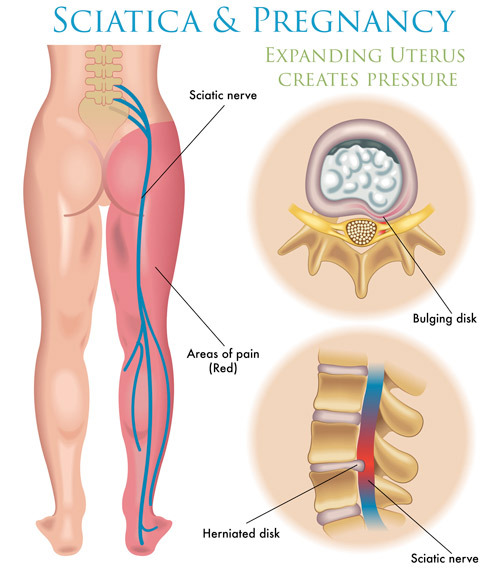 The sciatic pain can be the result of the expanding uterus or weight of the fetus putting pressure directly on the sciatic nerve. The shift of the center of gravity pregnant women experience can lead to altered biomechanics of the spine which can also result in sciatica. As a chiropractic adjustment aims to realign the spine, taking the pressure off of the nerve, many pregnant women are able to find relief from sciatica. Rest assured that chiropractic adjustments are entirely safe for Mom and Baby. Sleep on your side. Place a pillow between your knees to provide pelvic balance and remove tension from the low back. Opt for flats. While high heels may look great, they place additional stress on the low back by constricting the joints. Perform pelvic tilt exercises. These exercises will help to stretch out the muscles around the pelvis. The cat/cow stretch is an ideal way to stretch these muscles. We can show you how to perform this exercise. If you’ve been sidelined by sciatica during your pregnancy, we want to help you get the relief you need. Contact Compass Family Chiropractic today to find out if chiropractic care can help you! We also invite you to check out our page on pregnancy chiropractic.